DAWG DAYS 2010! 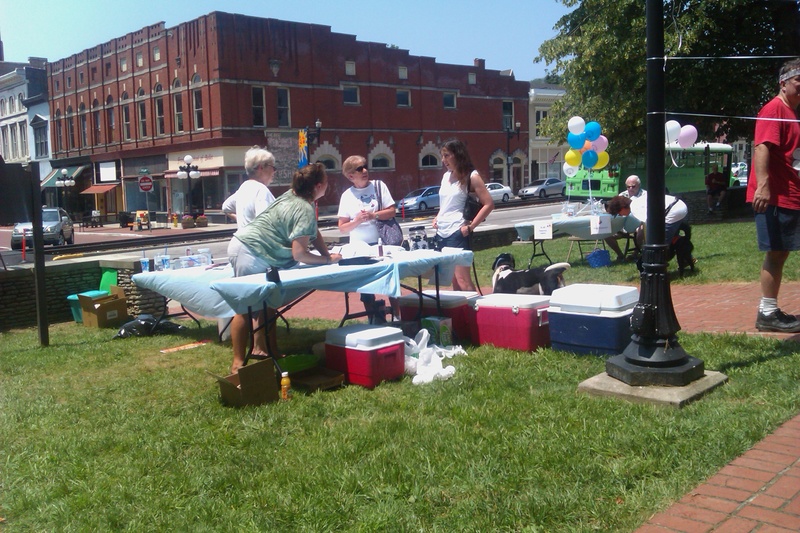 is a fundraiser event that was hosted by the Franklin County Humane Society last weekend. The event was held at the Old State Capital on Main Street. The Capital is now a museum, but my grandma said she used to work in the building back when it had offices in it. It was a little hot outside, but a little cooler than it had been for several days. There was lots of shade because of all the old growth trees which helped keep the dogs cool as well as the humans. It was a laid back time with some raffles, dog contests, music, and games. My grandmother came to the event with us and helped us watch the dogs. I’m glad she could come out and have fun with us! The contests began with the dog treat catching marathon. This called for Roxie, who can always catch her treats in the air. Her and another dog caught every single one! So they tied for first. Next we entered all three dogs in the costume contest. Roxie was a hula girl, Greenlee was Dorothy, and Heidi was the bad witch from Wizard of Oz. It was a tough one, so the judges made a costume category and ‘best dressed’ category. Roxie won first and Greenlee and Heidi tied for second in the costume contest! There were a few more contests throughout the day. All of them did really well! We thought Roxie would win highest pitched bark and Heidi would win loudest bark, but they dogs don’t bark/howl on command. Only if there’s a squirrel or Roxie is playing with Heidi. Students from a local pottery shop on Main St. made food/water bowls and donated them to the humane society. Then the society gave the bowls away for donations. I thought it was a great idea and the bowls were very nicely crafted. I would like to go to the shop someday and try out a pottery wheel! We also walked around downtown a little bit and discovered some of the shops that had been there forever. My mom showed me where she used to work, a small local department store. We also saw MaGees Bakery and the Backstretch Diner where we got some french fries to snack on. I’d like to visit some of these places sometime. It was a fun event and felt good to participate and donate for a great cause! The dogs were really worn out and I’m sure they were happy from all the treats, attention, and winning!